Mariah Carey "The Elusive Chanteuse" Show Tour Live In Malaysia 2014: Happy Malaysia Day! 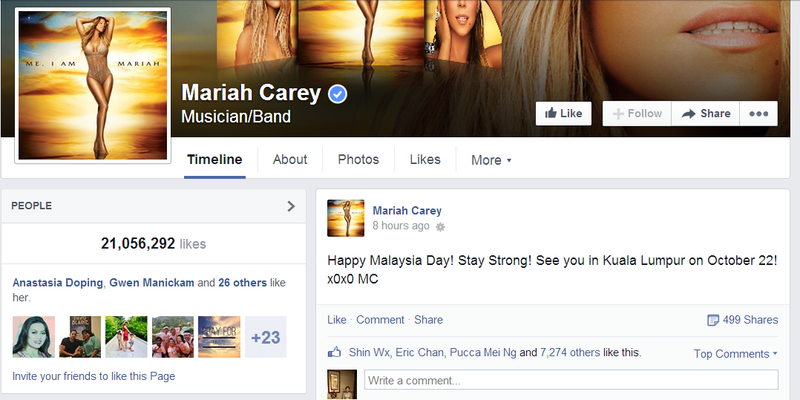 Mariah Carey, wishes Malaysia "Happy Malaysia Day! Stay strong! See you in Kuala Lumpur on 22 October ' XoXo Mariah Carey". The best selling female singer of all time will hit our shores next month, bringing her tour entitled Mariah Carey 'The Elusive Chanteuse Show' Tour In Malaysia 2014 on 22nd October at Merdeka Stadium in Kuala Lumpur at 8pm. Mariah Carey, wishes Malaysia "Happy Malaysia Day! Stay strong! See you in Kuala Lumpur on 22 October ' XoXo Mariah Carey"
Apparently Mariah's Malaysian fans told her about our National Day and the thoughtful Diva took the opportunity to wish her much missed fans in Malaysia where she performed to a 20,000 crowd in 2004 which Mariah said was one of the best shows as the heat of the night unexpectedly gave her better vocal performance on stage. 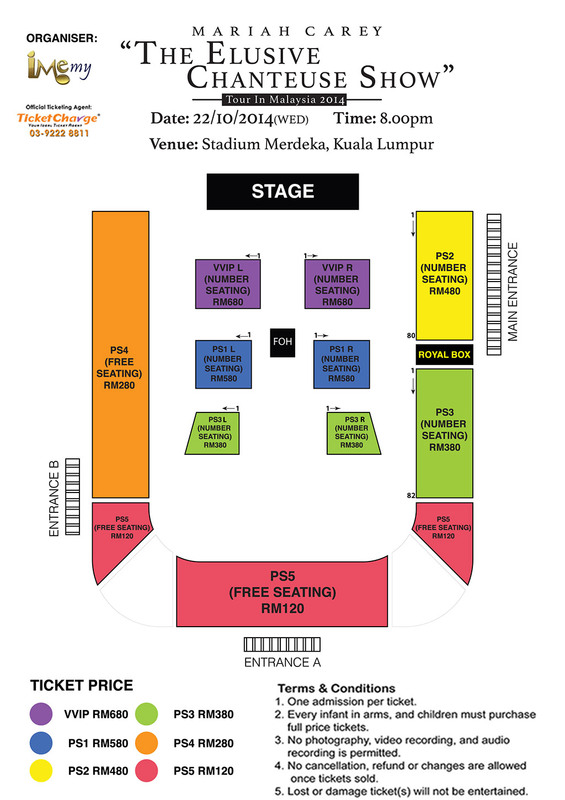 Mariah Carey “The Elusive Chanteuse Show” Tour In Malaysia 2014 is organized by IME Productions and supported by Malaysia Major Events, an agency under the Ministry of Tourism & Culture, Malaysia. “We are excited to have Mariah Carey to perform here in Malaysia in October. Mariah’s live concert in Malaysia 2014 is a wonderful way to bring people together and we are very proud to be able to support it. Such event will further complement arrivals for Visit Malaysia Year, especially from the fans from the region and it also complements Malaysia’s position as a favourite destination for live entertainment in South East Asia. This event is expected to bring in approximately 3,000 fans from across the region with an estimated tourist spend of over RM15 million. Malaysia Major Events is glad to reward fans with this priceless opportunity to meet their favourite idol and hear to her sing their favourite songs.” said Tony Nagamaiah, General Manager, Malaysia Major Events.